Meg Kinnear speaking at a workshop in Minsk in 2012. 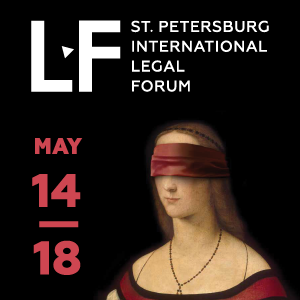 CIS Arbitration Forum continues its series of interviews with representatives of major international arbitration institutions working on disputes related to Russia and the CIS region. This month Professor Yarik Kryvoi interviewed Meg Kinnear, who since 2008 has been the Secretary-General of the International Centre for Settlement of Investment Disputes (ICSID) at the World Bank. 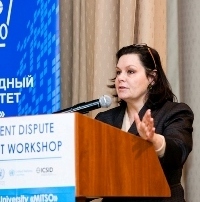 Ms Kinnear shared her thoughts about why a significant share of the ICSID caseload relates to former Soviet Union countries as well as her tips for those who want to become ICSID arbitrators and how to make ICSID more accessible to smaller claimants and explained the ongoing process of ICSID reform. Yarik Kryvoi: It appears from the ICSID 2016 annual report that Eastern Europe & Central Asia is the second largest group by State party involved. In previous years that region often had the greatest number of newly registered ICSID cases. Why do you think ICSID is in demand in the region? Meg Kinnear: This is correct. I was looking at our 2016 Statistics Report and in fact 31% of the cases were from the Eastern Europe & Central Asia region. Four of the cases registered in 2016 involved CIS States: one with respect to Kazakhstan, one with respect to Moldova, one with respect to Turkmenistan and the other involving Ukraine. So, certainly these States have been involved in investment arbitration recently. My suspicion is that these numbers relate in part to the increasing importance of foreign investment in these States. Much of that investment relates to the oil, gas, mining and power sectors and to building infrastructure. These are often long-term projects – 25 to 30 years. They are often high-value projects and it is quite usual for them to involve foreign partners. So, it is not surprising that if there is a dispute, it may end up as an international arbitration at ICSID. In that context, ICSID makes a lot of sense as a dispute forum because it is an impartial international institution set up to solve cross-border disputes. ICSID has the most expertise in this area and it has the capacity to act in multiple languages and in multiple countries. So, if you recall the kind of sectors and disputes involved, it is not surprising that there are a number of cases at ICSID. Yarik Kryvoi: Is this likely to change? Meg Kinnear: The big question – as you say – is in terms of the future, and if it is going to continue. In some ways this reflects a positive fact because it reflects an increase in inward investment in the region. At the same time, obviously, no State wants to face multiple investment arbitrations. So, ICSID has done a lot of work, first, encouraging States to look at how they can try to prevent disputes from arising and second, where a dispute does arise, to encourage States to be well prepared for the arbitrations, so that they manage the proceedings well. 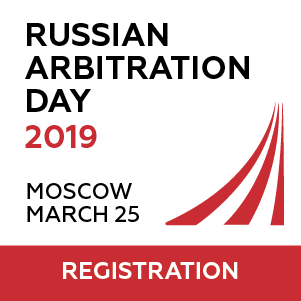 In particular, we have published a guide for respondents in arbitrations (“Practice Notes for Respondents in ICSID Arbitration”), and we have done many training sessions – including some in Eastern Europe, for example in Minsk and Kiev. There is an upcoming course to train mediators in ISDS. So, those efforts are ongoing. Many States, not just in Eastern Europe, are also looking at what they call early warning systems, which are very useful. The World Bank is helping States to develop early warning systems, so they design measures that are less likely to result in disputes. They also encourage identifying when a dispute is likely and trying to deal with it before it becomes an arbitration. Yarik Kryvoi: As I understand, very rarely the disputes are heard by arbitrators from the CIS region. Why is it the case, what can be done about it? It is an important issue and it is one we hear more generally in ISDS. Part of the explanation is that ISDS and investment law are still quite new, and even though you read a lot about it and it has a high profile, in fact it is a very small portion of the overall arbitration picture. The key here is for lawyers from the region to get exposure and experience in the field, so that they can develop this expertise and ultimately become the next generation of investment arbitrators. At ICSID we have done a number of things to provide experience in the field. We have an internship programme, where five to six interns come for four months to learn about investment arbitration, see cases and work on files. We have a diverse group of interns who get that experience. We continue to do our training sessions in all regions, and did more than ninety sessions last year. We also have a very diverse group within the Secretariat that is composed of 70 people, and more than 34 nationalities in our group. We have also been focused on diversification of arbitrators. The issue is not just about regional origin, but also about gender. We have done that by creating a special ballot process, where we try to put forward some names from different regions and people who might not necessarily always be the ones counsels think of immediately. We have also encouraged States to update their ICSID list of arbitrators, which is used for default appointments when the parties cannot agree on an arbitrator. But when we talk about diversity, the other important point is that roughly 75% of our tribunals are appointed by the Parties. So, if you are going to succeed in diversification, you must get the parties and counsel to think about that aspect of the selection process. I believe it is happening, but it is an evolution. 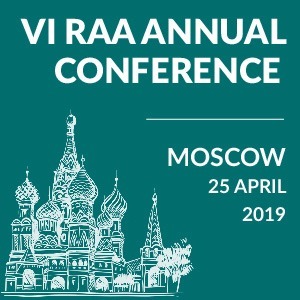 Yarik Kryvoi: What about your tips for those who want to become arbitrators and are based in that region? What should those who aspire to become ICSID arbitrators do? Meg Kinnear: Basically they must get the expertise and experience in doing cases. For example, get experience with law firms that do these cases, get experience being a secretary to a tribunal, or working in a place like ICSID. Get as much experience as you can dealing with investment arbitration, so that you can show the Parties that you have this experience and knowledge, and are ready to act as an arbitrator. Yarik Kryvoi: It appears from your annual reports that the role of the Energy Charter Treaty as a basis for consent has been growing in the past years. If so, what is the cause of it? Meg Kinnear: Absolutely true. We have had a significant growth in Energy Charter Treaty cases. Last year they were 18% of the ICSID cases. Not that many years ago they were probably 1% of the total caseload, so there has been a significant increase in these cases, in particular with respect to European States. Obviously, some Eastern European States have been involved, but if you look at ECT cases, many Western European cases were involved as well. Yarik Kryvoi: So did the arbitration users just not realise that the ECT has all these jurisdictional provisions, or why do you think it happened? Meg Kinnear: I assume part of it is the growth in those industries that are subject to ECT arbitration. It is also a reflection of the kind of resources that are a key part of these economies, for example, getting infrastructure development and joint ventures with foreign partners in the energy sector: so, I think it reflects what is happening on the ground. 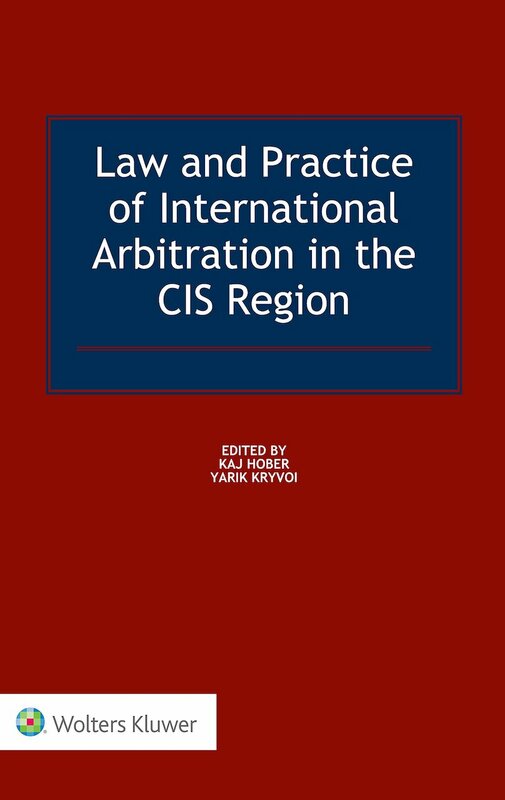 Yarik Kryvoi: Most investors from the CIS region are not large multinationals and they may feel intimidated by high costs of proceedings, particularly at the jurisdictional stage. Is ICSID considering steps to become more accessible to smaller claimants? Meg Kinnear: Investors should note that ICSID is the most cost-effective forum for investment arbitration: we have caps on arbitrators’ fees, the Centre charges a low block fee for services and hearing facilities at the World Bank are offered at no extra charge in ICSID administered cases. We have also done a lot of work on case management and technology, which contributes to reduced costs. For example, we always offer video so that parties can have a video-hearing instead of in-person hearings. This frequently saves time and money by having a hearing by video connection. The more difficult thing is the cost of counsel. This is estimated between 80% and 90% of the costs. We encourage parties and their counsels to sit down and determine “what’s the cost-effective way to do this.” For example, what are the motions that are worth the time and energy? This can be very useful. Finally, many of the upcoming amendments will have at least a component that makes them more cost-effective and more time-effective. Yarik Kryvoi: I imagine that you are open to proposals on how to make the system more efficient, including as a part of your revision process. Meg Kinnear: Definitely. We have not done a Rules amendment for about 10 years – since 2006. One of the stated purposes of this amendment is to modernise the Rules where possible, and to make the system more cost-effective and more time-effective. We are open to all suggestions, including practice techniques and formal amendments that expedite the process. Yarik Kryvoi: Are the States also involved in this revision process? Meg Kinnear: Yes. We invited every State to designate someone within their relevant government department to be a contact for any suggestions or any feedback they want to provide. This is a good way for States to be involved, and I’m hoping that all our Member States will take advantage of the opportunity. We also issued an invitation for the public to contribute, and some useful comments were received from various members of the public. These have been published on the ICSID web. All of the suggestions received are being considered in drafting the background papers that we are preparing. It is going to be a useful way to talk about some of the issues that arise in ISDS, but also to focus on taking the system we have and making it even better. So, I think this is a very good initiative and it will be interesting for everybody that does this kind of work and who follows this field. For interviews with representatives of other arbitration institutions please click here.